Posted: Sat 11 Sep, 2010 12:18 pm Post subject: Contest: Ready, Set, Donate! myArmoury.com is in the midst of a member-initiated donation drive to help me with the cost of running this place. I set a donation goal equal to the year's annual server hosting bill. It's not the only expense this site has, but it's the biggest. Your donations will keep me having to flip the bill on my own. This is our second year of being on our own dedicated server. For years, the site's performance was a big issue and having it hosted on its own machine has been a huge improvement. This also has provided the benefit of saving me some time as I once had to do a tremendous amount of maintenance and whatnot to keep the old site online. That's not an issue any longer. This was made possible because of last year's donations from the community. Thanks goes out to all of you who contributed. Long-time myArmoury.com member Jean Thibodeau initiated this year's donation drive and has put his money where his mouth is. This is the second year in a row where he has personally sponsored a donation drive contest. He's stepping up big time to do this and I want to publicly thank him for doing so. Jean has purchased a two great prizes to be given away to the lucky winners! 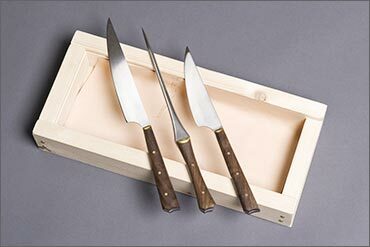 The first place prize is a very nice custom one-of-a-kind knife set made by Michael Pikula. It consists of two knives and a pricker. The larger knife is about 10" long with a 6" blade. 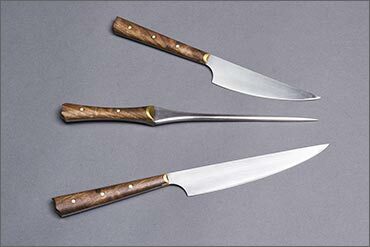 The shorter knife is 8.75" long with a 4.5" long blade. The pricker is about 9.5" long with a 6" long "blade". The hardwood has a really attractive grain and is augmented by brass rivets and fittings. The fit and finish is tight and beautifully executed. The blades are very sharp. This is a very nice set and it's encased in a box of its own for storage. Sweet. 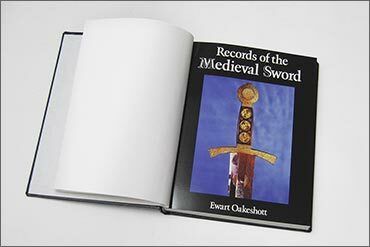 The second place prize is a special hardbound copy of Records of the Medieval Sword. This is a valuable addition to any library. The only edition that is commonly available is the softcover version and it falls apart with ease. This prize has been expertly rebound into a hardbound edition! Jean wants to encourage first-time donors so we're going to make the contest terms very simple. You must be a registered member of myArmoury.com and have donated $10 US or more within 90 days of the contest's start date or be a current member of the Benefactors, Upgraded Members, or Premier Members usergroups. Donations made after Jun 13, 2010 are considered. Please note that anonymous donations cannot be counted. Entrants must be made prior to contest close on Monday Oct 11, 2010 at Midnight PST. All participants will be entered into a drawing and the winning names will be randomly selected later that same day. Domestic shipping charges are included with the winning prizes, but international winners will be required to pay for shipping. We are thankful for anything you can give. Please note that another contest will follow shortly after this one and all who contribute to this site will be eligible for that one, too! Oh my! Jean, I was just kidding yesterday about a Michael Pikula prize. Your generosity knows no bounds. I am in awe. Well at least now I don't have to keep it a secret although I was sorely tempted when I let slip the teaser about something coming. I really like the idea of this contest eligibility goes back to donations given up to 90 days from the start of the contest as I was concerned about people who may have contributed on their own days or weeks before the start of the contest and it would have been a shame for someone to miss out after giving a contribution just before the official start of the donation contest period. Oh, if someone just contributed $5 , which is very much appreciate, they might consider contributing another $5 to be eligible for the contest. As I said at the top of my Donation Topic I do want to encourage as much as possible a large number of small donations so that the burden/privilege of supporting this site is distributed widely and not dependant on a small number of large contributors. Obviously somebody wanting to give more or who can and wants give more is certainly welcome. I gave Michael a budget and let him decide what to make for the contest prize and he put in a great deal more that what I paid for, so he should also get credit for the prize as he did an outstanding job and went way beyond the minimum requirements to fill the custom order. The book was part of a series that Chad offered a while back when he bought soft cover editions and had a dozen or so professionals re-bound. At the time I ordered a copy for myself and an extra one in anticipation for a prize. If others wish to contribute prizes to " myArmoury " I think that they select one of their favourite makers and buy one of their product or have a custom one made and sent directly to Nathan who will then use it as a prize: This helps " myArmoury " but also helps a maker by giving them some needed business and some " BUZZ " or " PLUG " for their work. So I consider that as we support this site we are also giving the whole community a boost helping the makers to have their work sold but also a place where ideas and designs are discussed and appreciated. Certainly the makers who do the work full time commercially are motivated by putting food on the table but the vast majority are also as motivated by their passion for period or modern design as are we. Since there are now two Topics threads dealing with the Donation drive I have two places where I can " bump " . Like I wrote in the other Topic when donating it would be interesting to hear stories about how visiting " myArmoury " and becoming a member has been useful to you learning " stuff ", making friends and how coming here has changed your life. Well change your life may be a little bit of an exaggeration but certainly if I hadn't joined this site I probably wouldn't have taken up period Longsword and I certainly wouldn't have had many pieces of my custom collection made as I wouldn't have discovered many of my favourite makers. One other change is that I can now type with only two fingers at quite a rapid pace but I depend a great deal on a spell checker to catch most of my typos that seem to happen a lot when I type too fast ! Since " myArmoury " I think my writing skills, both typing speed and vocabulary, have gotten a good workout. Another thing that I would be curious about is knowing how often some of you visit " myArmoury ": I know that I visit each day, I don't always log in but I will check for new Topics or posts multiple times each day. Some of you may visit only every few days or maybe once a week or once a month ? But I expect that many are addicted to the site and don't want to miss interesting debates on the many Topic threads they may read or have contributed a post to. Anyway, I do get a lot of entertainment value coming here so if I had to pay $1 for each time I visit I guess I would have to contribute more than $1500 a year as I average 3 to 5 visits a day. Just a short lazy " Bump " to keep the Topic at the top. Only 385 views so far so I figure that not everyone has had a look at the contest conditions post, so it seems worth while doing frequent or at lest daily bumps. A very pleasant way to remind everyone to donate, which i have to admit i really forgot. Since i already have the book i made an anonymous donation. 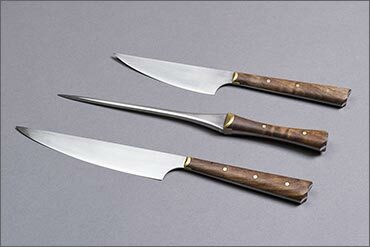 Maybe the really nice knives tempt me to make another one and if i should win the book ... well, there is always room for a new donation drive. 5) The contest system cannot allow anonymous donors to join the contest. We respect the privacy of anonymous donors and so do not store the private information of anonymous donors. So I guess if you want a chance at winning the knives and pricker you should consider making another donation. ( Note for all the contest rules make sure to read the conditions to be sure to qualify: See Nathan's anouncement post it's at the bottom in smaller text ). Just another " BUMP ": My other bump on the other donation drive Topic is more verbose today but this one has the details of the contest and some people reading the other Topic thread might not read all the posts and miss the info about the contest: Well that 's my " lame " excuse to bump up the two threads. Don't forget to enter this contest. It's available to all current members of the Benefactors, Upgraded Members, or Premier Members usergroups as well as those who have donated $10 US or more since Jun 13, 2010. There are many members who are in these groups who have not entered the contest yet. If you don't enter this contest, you can't win. There will be another contest immediately following this one. Like Nathan said enter the contest by clicking on the " CLICK TO ENTER CONTEST " button: I think some people because they belong to the groups mentioned by Nathan assume that they are entered automatically and didn't click on the contest button. In any case, consider this at least another " BUMP " if I'm incorrect in assuming why some haven't entered the contest who are eligible to including those who have donated $10 who should also click on the button. If the button says you can click it to enter. That's all you have to do. Myself I haven't entered the contest since I'm giving the prizes I don't think it's fair or desirable that I enter and risk winning one of them. In any case I would have passed on it and let someone else win the prizes. Been using my Michael Pikula by-knife as a good kitchen food preparation knife and it holds an incredible razor hair popping edge and I'm very happy about it as well with my Partisan Spear and Cinquedea also made by Michael. 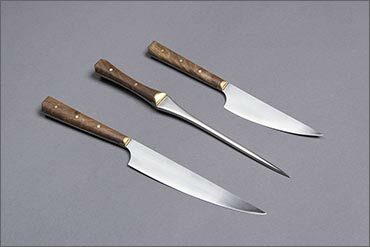 As well remember that the prize Knives and Pricker are " forged " steel using the best of materials and would be very much using knives for one's kit or even used in a modern contexts as hunting or utility knives. So the prize knives are well worth winning. 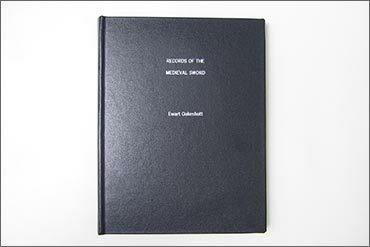 The book is also a must have reference book and with the fine binding that Chad had made it is also much more attractive and durable than the currently available soft cover. Anyway, trying to tempt you to donate if you haven't already and can afford to do so. The funny thing is that I can't remember exactly how I found this site the first time. I do remember finding it about 6 months before I joined ( Lurked for those first 6 months ). Now often we don't remember these things because one had no idea at the time that the " event " would have a lot of meaning way down the line and when it did become important the memory of how one found the site has faded away. Now, at the time the site that I went to the most was the Albion site and I may have seen a link there to " myArmoury " or a customer review/feedback mentioning " myArmoury " . Now, what I am sure of is that when I found this site I immediately put it in my " BOOKMARKS " on my MAC and it's been at the top of my list of bookmarks. Just a simple " BUMP ", past half way there and about 52 donors so far. Don't forget to post comments about why you like the site and maybe tell us how you first found this site. And if you have good ideas or words that you think will help motivate people to donate don't feel shy to do so and bump the Topic: There are only a few weeks left to attaint the donation objective: The donations came in rather quickly at the beginning but have sort of stalled or at least slowed down in the last few days. ( Not worried yet but I would hate for Nathan to have to pay for the hosting bill considering that he is already supporting the site with all the un-billed work he puts in and the hosting costs are just part of the money it takes to keep this site functioning ). Hey Jean, thanks for keeping this stuff in mind. Just to be clear, I've already paid for the annual hosting out of pocket. With nothing else changing, I'll be about $1100-1200 in the hole by year's end. I've had it worse. Like you said in another topic, I choose to do this project and keep it online. The help from the community eases the expense and I appreciate every contribution. At the end of the day, the site will stay around until it becomes way too much of a burden. We're nowhere near that point. Not even close. We've had very, very few contributors this year. Kind of a bummer. I hope people still like this place. We get a ton of traffic. I wish I had the resources to put out the content / updates that I once did. That's a big regret on my part. I just signed up for an upgraded membership account. Thanks for the contest Jean. Looking at the numbers of posts and the numbers of people who have posted 200 times I read that there are exactly 203 people who have posted 200 times or more: To me this means that these 203 (Well some of which may not currently still posting ) have a stake and great interest in the site and find it valuable to almost indispensable as a source of information and interesting debate. At this moment there are a bit more than 50 people donating (Some of which are very new to the site and have maybe not even posted a comment: By the way thanks to these for contributing i.e. being a low poster doesn't mean any less interest in the site ). So we are past the halfway point with approximately 50 donors, if 150 gave just $10 we would have $1500 more and be way past the objective. So like I wrote before you can make a very small donation but if enough of you do it, it isn't a big strain on the budget unless one is unemployed or in dire straits ..... I don't expect people putting this site before raw survival but if you are in O.K. financial shape just drink 3 or 4 less coffees and a donut and contribute the $10 to $20 to pay for the hosting of this site. Oh, and as Nathan said he already paid this hosting out of pocket and it's only a part of the costs in money and time that Nathan puts into this place: Something he does because he wants to do it but I think we should give him a minimal amount of help and the contributions also do a lot to let him know that his work is appreciated. I don't want to " guilt " you guys into contributing ..... too much ! But helping the site financially does make it " YOUR SITE " to a degree and you can share in the feeling of pride in participating in a very classy and educational and entertaining site. Sander: Very much appreciated and you are doing some good things for my morale here. ( Don't forget to click the button to officially enter the contest for the prizes ). I know that Nathan really dislikes asking for money and it's not my favourite things to do but I really want this site to be here years from now even if as Nathan said there is no danger of closing it down anytime soon if the costs build up over years it might become more challenging for Nathan to keep it going if he ends up feeling that he is doing all the heavy lifting. Oh, can someone donate $8 or $18 ( More than $10 to qualify for the prizes ) to make the total a round number since we are at 1792 as I write this. You're funny, Jean.... wanting to get a round number. haha! Why doesn't that surprise me? For me, I'm dying to get this contest over. I have several more lined up and want to get them out there. I think I might like running the contests more than you guys like them. I mean, I'm sure it's great fun to win the contest, but I can't imagine anyone sitting anxiously waiting for the winner to be announced. I'm the only one who does that because it's fun surprising people and giving stuff away. I suppose there's no harm in having two contests running at the same time. We've never done that. I guess I should put some thought into that. This contest is open to all current members of the Benefactors, Upgraded Members, or Premier Members usergroups as well as those who have donated $10 US or more since Jun 13, 2010. If that's you, then make sure you enter it!